From the 1950's to the 1980's, there was a proposal to build a 4-lane expressway paralleling PA Route 48. This proposed highway was officially known as the "North-South Parkway", but locally known as the "New 48". Sadly, this route never came to be; however, it is the predecessor of another highway, The Mon-Fayette Expressway. The "New 48" was a highly debated route that really never got beyond the planning stages. There are very few remnants of construction left. The early 60s would see much of the logistical and planning work take place for the new highway. On May 24, 1963, a public hearing was held to discuss plans for the new highway; however, there was not any follow up articles published about the hearing. Throughout 1964 tensions between Southwestern Pennsylvania Planners and the State Department of Highways escalated as political and business leaders in Southwestern PA began to doubt the commitment from the state. On May 22, 1964, Mr. William Proudfit of the Route 48 Association spoke at 9:00 am at a super-conference of State Highways Officials and local leaders held in Monroeville (2). Leaders and backers of various other highways also spoke at this conference. Unfortunately, it is not known what was discussed. In the late 60's, land was acquired in White Oak Borough. Much of this land was at or near the current intersection of Route 48 and Lincoln Way. The state purchased the land containing the Rainbow Gardens Amusement Park via eminent domain. The park closed and was torn down in 1968. The park was home to a drive-in movie theater, swimming pool, roller rink and a few rides. Right of way was cleared including the amusement park that my mother used to go to as a child, Rainbow Gardens in White Oak. Now it is a shopping center called Oak Park Mall and nearly every time we drive past she says, "That used to be my amusement park. They tore down my park to build a road!" According to Matt Boyko, there was once a proposal for an "East-West Expressway" that would have begun at US 30 at either the PA Turnpike Irwin Interchange or at the western end of the current-day US 30 Greensburg Bypass and would run from those points West to current day Interstate 79 in the Heidelberg Area. The New 48 and the proposed East-West Expressway would have shared a brief alignment in White Oak near the current PA 48 and Lincoln Way Intersection. I was also told by family that the Rainbow Gardens area was to have a large cloverleaf interchange with Lincoln Way. Little is known on what officially killed this project - or if any definitive plans for the route of this highway were made. However, it is safe to assume that like many of the regions and the state's highway projects of that era, PennDot's financial struggles killed any chance for the highway to be built. When the Mon Valley/Mon-Fayette project was resurrected in the 1980's, leaders of Eastern Allegheny County communities had hoped that the revived highway would follow the path of the New 48. However, this routing was quickly removed from consideration as the state chose a route that will run closer to Pittsburgh. Finally in the early 1990's, PennDot finally sold off the remaining right-of-way in White Oak thus ending any chances of the "New 48" ever to be built. If you had a Pittsburgh area map in the 1960s and well into the 1980s, the New 48 was shown as proposed and under construction even if the reality was nothing was being done. I have a number of maps that show different routes and plans for the New 48. 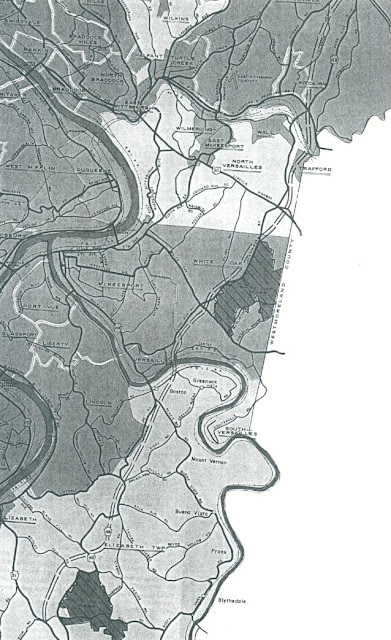 The 1963 Pittsburgh Area Transportation Plan (shown above) shows a general plan of the New 48. The highway works almost as a southeastern leg of a Pittsburgh Beltway. 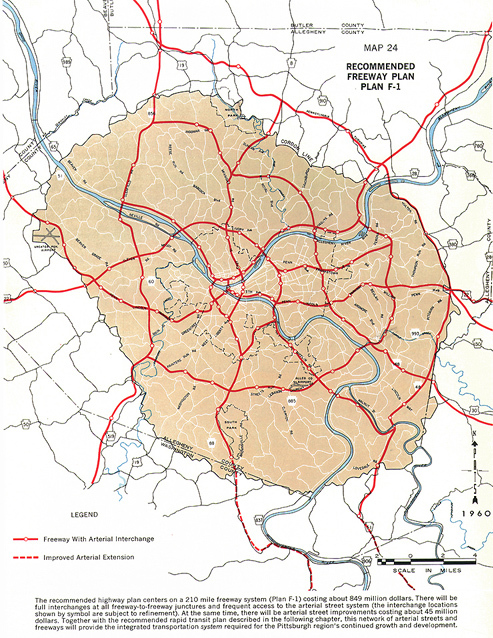 The map was the proposed Pittsburgh Highway network in 1980 of course much of it never happened. The New 48 would have interchanges with Route 51, Lovedale Hollow Road, Center Avenue/Ripple Road, Lincoln Way, US 30, PA 130, and end in Monroeville at either the PA Turnpike or the Parkway East (I-376). It is also possible that the highway may have had additional interchanges that weren't shown. Another map that I own shows a more detailed routing. This is from a Rand McNally Map (Gulf Oil Company) map of Pittsburgh from 1968. The Southern segment of the New 48 through Elizabeth Township. The general routing of the New 48 would be as follows. The map doesn't show the connection with PA Route 51 However, there is a clearing along PA 51 between PA 48 and Round Hill Road Extension that suggests that New 48 would begin here. The new highway would have then crossed over Pearis Road between PA 48 and Dillon Road. You may recall this as the 90 degree turn on Route 48 where there used to be an old caboose. This would be about 1/2 mile from my childhood home on 48. There would have been about 5-6 homes cleared for this crossing. The expressway would have then traversed between Simpson Howell Drive and 48 crossing Route 48 near Circle Drive. This would have been not the Mill Hill/ Circle Drive Crossing but the Circle Drive Crossing at the S curve on the hill. The New 48 would have climbed or cleared a hill to that point. Keep in mind that this area of Elizabeth Township began to see residential development during this time, and the new highway, if built, would have greatly changed the area. The highway would have then crossed Route 48 at the base of Lovedale Hollow just south of Broadlawn. It would then go along the ridge or through the hill across Mansfield Road (behind the former Puck Jones restaurant, now Cross Creek Inn) The map's route places the New 48 between Ridge Rd and current PA 48. It would then cross Renzie Road before the sharp downhill switchback curve along Renzie. The expressway would then cross Smithfield Street in Boston near Constitution Avenue. It appears that by the angle of the map's routing, the New 48 would have avoided many of the older homes along the Boston Slopes. The Youghiogheny River Bridge would most likely have been a high-level bridge coming from Renzie Hill in Elizabeth Township across the river to near the intersection of Center Street and Center Street Extension in South Versailles. 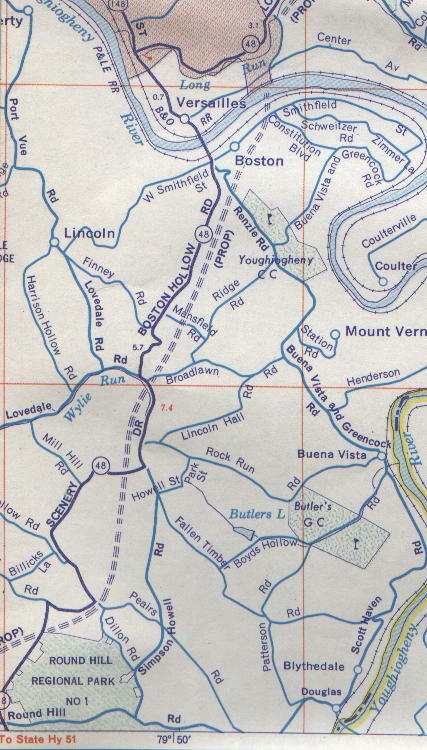 After the New 48 crossed the Youghiogheny River, the highway would then head downhill towards and then parallel current PA 48 to its east also remaining east of Long Run Creek. The expressway would then remain parallel to current Route 48's east to Monoreville. The routing would go over what was Rainbow Gardens and what is now the Oak Park Mall. New 48 would continue north through the western edges of White Oak County Park and then through the McKeesport Sportsman Association. The highway would have crossed US 30 to the east of the former K-Mart Shopping Center. It stays east of Wall before what are now the Conrail railroad tracks. The map does not show the highway's routing in Monroeville,; however, Bruce Cridlebaugh explains how the New 48 may have been routed through the municipality. The old Monroeville map that the real estate companies used to give out in the 70s showed a proposed PA 48. It looked like the new highway would've crossed Northern Pike at Deauville Apartments/LaVale Dr. This would've brought the road to meet US 22 nearly a mile east of the PA Turnpike -- east of Giant Eagle on Old Wm Penn Hwy -- in the area of the former Burke's Glen Pool (now a car dealer). Another old map of Allegheny County shows a different routing of the New 48. This map from the Allegheny County Highway Division shows a four lane 48 with a few more bends to it. 1973 Allegheny County Map showing another routing of the New 48. One item is that this route avoids both county parks - Round Hill and White Oak - and runs west of today's Route 48 in Monroeville. In Elizabeth Township, the highway runs to the west of 48 and the northwest of Elizabeth Forward High School. Interestingly, the new highway crosses Route 48 for the first time basically through the middle of the neighborhood I grew up in. I really don't know how close the New 48 came to being built. By the looks of things,it may have been on the planning books but never got further than that. Like nearly all Western Pennsylvania proposals of the day, the plans for the New 48 fizzled out, shelved, and eventually cancelled. However, you can't help but wonder what the area would be like today if the New 48 was built. Elizabeth Township would have been much different as would many other communities in Eastern Allegheny County. As always, if you have any additional details about this project, leave a comment or drop me an e-mail. (1) Matt Boyko, who provided information from "White Oak: A Master Plan"
(2) Agenda - Pittsburgh Meeting of the State Highway Commission May 22, 1964. (3) State Highway Program in Allegheny County Status; 1963. (4) State Highway Program in Allegheny County Status; September 1964. (5) State Highway Program in Allegheny County Status; June 1966. (6) Smeak, Roma. "Interesting Study of the Undeveloped 48." Personal e-mail. Sept. 15, 2004.